You might think that this was an easy photo to take…and you’d be wrong. All good pix by Ms. Monk, Ms. Ware, + Echorich. Bad pix by yours truly. 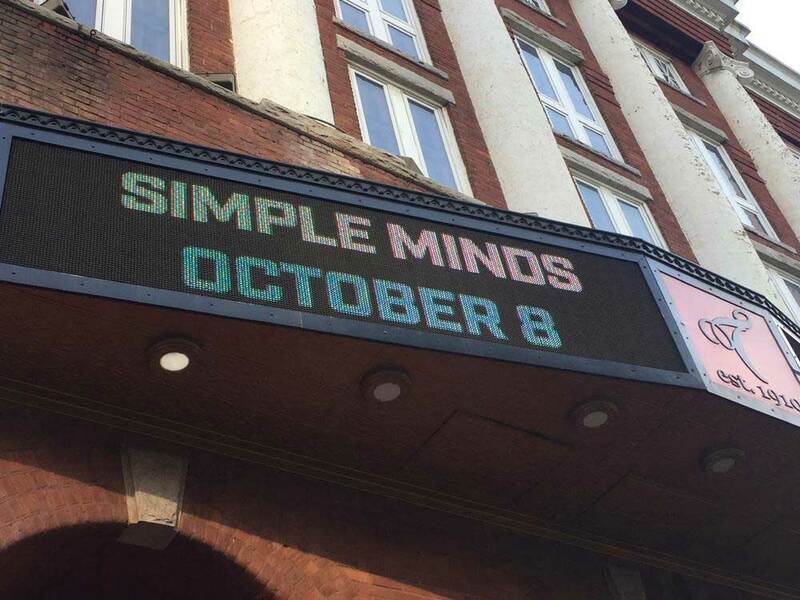 So I have already discussed the pain and degradation of buying the tickets for this Simple Minds show earlier. I was no fan of the fact that if I wanted a block of five tickets for Simple Minds in Atlanta on October 8th, I pretty much had to lay out for VIP tickets due to the lovely ‘bots of Ticketmobster [and their third party partners in scalping] eliminating 80% of the seating within seconds of the opening of sales. Read all about it here, if you have a strong constitution. Having made a kind of peace with that fact over the months prior to the show, by the time we rolled into Atlanta on Saturday afternoon, we linked up with Echorich and Mr. + Mrs. Ware for a weekend of fun and good fellowship that involved dining, plenty of sitting around conversing, and yes, record shopping for the gentlemen. The ladies had high tea and glassblowing; two far more elegant pursuits to engage them. The tales of the record store are yet to come. 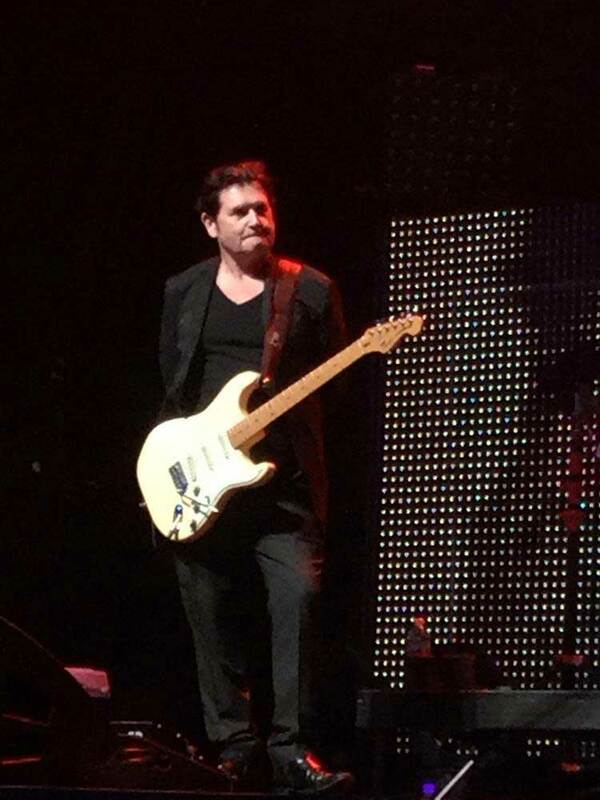 Today we’ll get right down to the nitty gritty on the hot topic of the 40th Anniversary “Walk Between Worlds” North American tour from the band. The band had booked a mind-staggering 24 date tour, only to add an additional seven dates at the end for a pulse-pounding 31 dates on the road. The biggest tour since 1986, surely? Heck, their last North American tour was just seven dates! We arrived at 5:15 for the appointed time for VIP check-in. We were immediately issued our poster/soccer scarf, lanyard and wristbands. The soccer scarf [Kerr is often prone to wearing these in concert, hence their appearance here] was much nicer than I had been anticipating. We later looked at the poster which was custom printed on top quality stock with the show date/location and it too, was of a very high caliber. So no Scot thrift shortchanging us. We waited in the concession area of the venue. The full-Monty VIPers [we opted for the “student package”] got a meet and greet first as well as a signed set list, so they were called up the stairs earlier. About 15 minutes later, we were all called up to the seating area where the band would soundcheck two exclusive songs. I had visions of “Empires + Dance” deep cuts roiling through my brain for the last few months, because to my thinking, anyone who would spend $160-$250 for a ticket didn’t need to hear “Oh Jungleland!” With that 5×5 tour experience under their belts, and having heard “This Fear Of Gods”[!] on their brief, seven date “Greatest Hits” tour in 2013, I had set my expectations fairly high! Jim played the host in an amiable, low-key manner. There would be some Q&A with questions presubmitted by email a week or two before the tour actually began. And two songs not on the set list played, but Jim told us right off that we would be getting an extra song this soundcheck of something they really wanted to take another pass at before it would be showing up in the final set list that evening, so three cheers for a bonus round. 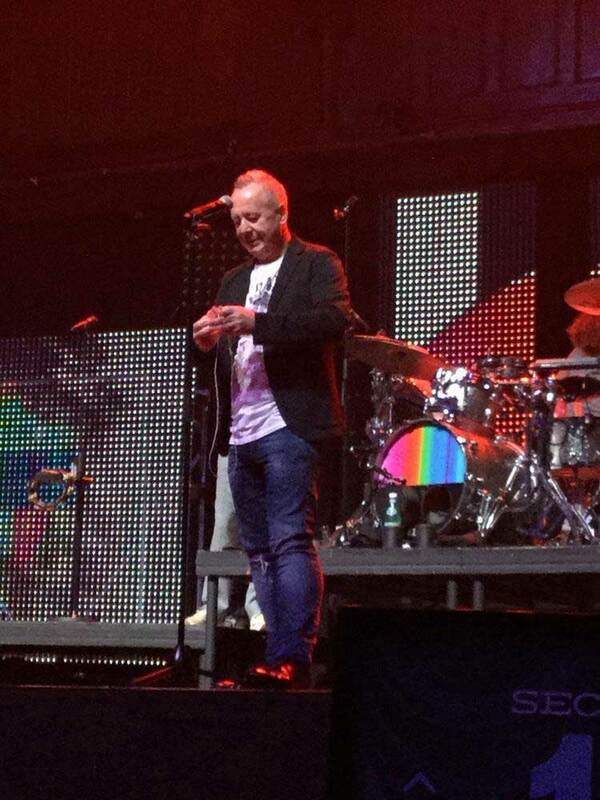 The first question picked was “if you were not in Simple Minds, what would you be doing?” Kerr passed the mic to each member for their answer before talking about how the only job he ever had apart from when he was a teen was Simple Minds. He didn’t think too much of mopping up a butcher shop. 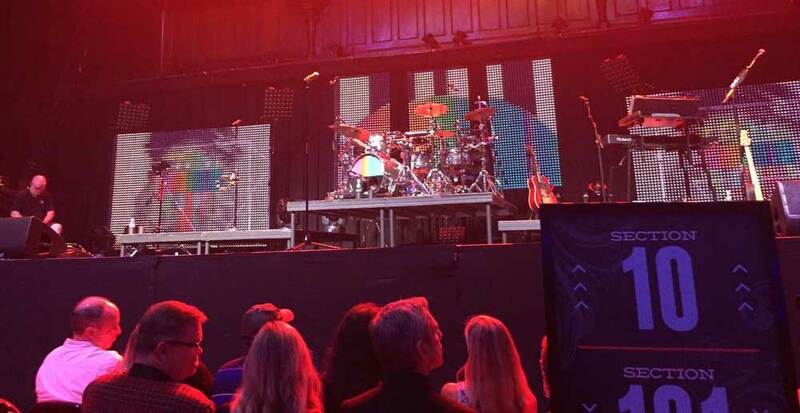 With the band on stage, they launched into a “different version” of “Speed Your Love To Me,” and while I hoped briefly for the famous “electro” arrangement of that, what we got instead was an acoustic duet between singer Sarah Brown and Kerr. <SFX: foghorn>. Oh my. This was not starting off on a good foot. The “Big Music” tour of Europe that never crossed the pond was where they first started making these stage moves, much to my dismay. Every thing I had read about that tour made me glad that it hadn’t. How they could miss the boat on the tour for such a solid album stymied me. Then, to manifest my darkest fears, they recorded an acoustic album and did a further acoustic tour [also mercifully absent in America] before turning around and recording their best album since 1983 as if to make my head spin from the aesthetic whiplash. Then they played their next song, which thankfully, was electrified, though no synths were used. The uptick in energy was welcome, but this was the weakest version of “Glittering Prize” that I’d ever heard. Then they broke for a few for the last of the questions from the audience. Strangely enough, one woman whose question was picked was not in attendance. Then they got ready to perform the bonus third song of the soundcheck. The one that would be later in the show. As soon as Jim mentioned touring in America, I spotted it as The Call’s “Let The Day Begin” coming right up to inflame Echorich’s gall bladder. He’s not a fan of this song in their repertoire, to put it mildly. They did it the last time we saw the band together in 2013, but that was before they had locked down the arrangement on the “Big Music” album to come. They had not yet given the tune it’s walloping “Waterfront” drum sound, or its buzzing synths. This evening it was performed as a duet between Sarah Brown, who took lead, and Kerr. The walloping drums were at least in but the tune was bereft of any synths, though certainly electrified. It was not the “Big Music” version, which is the only version of this song that I’m actually down with. And then it was over and they said their goodbyes, and drifted offstage until showtime. Leaving us to exit the stage to head back to the concession area. It was near seven with an 8:00 showtime. 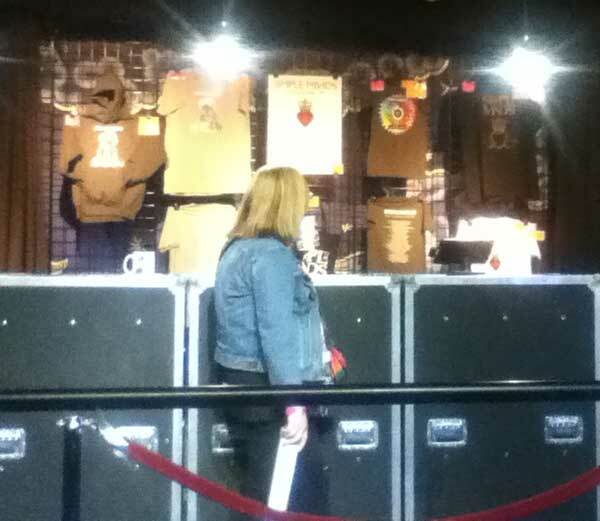 The standard admissions were not yet in so we checked out the merch table. The pickings were slim. 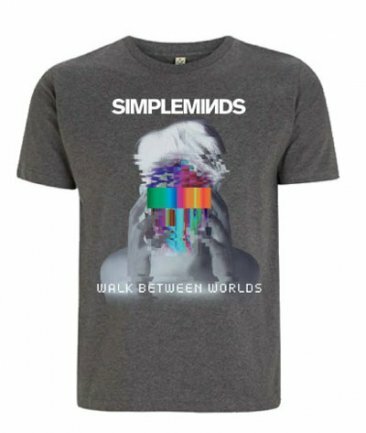 There were, I kid you not, new versions of the 1986 tour shirt that I was still trying to forget for sale! Half the shirts had than damned Claddagh on it. This does not fly in Monktown. 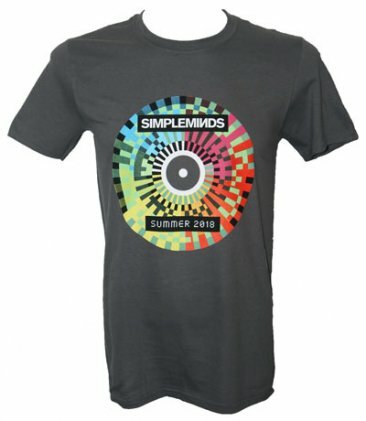 There was a gray shirt with the album art in negative on it but the clear winner was the shirt with the “Summer” single artwork on it [see left]. When I got there there were only XS, M, and 3X sizes available! Then they blacked out the M leaving only the drastic extremes for sale! Too bad since it was the one to get. I settled for the gray album art shirt [see right], as did Echorich, who also had his heart set on the “Summer” design. At least the prices were fair – $25 for shirts and $45 for the hoodie. But no tour book was in evidence either. They seem to have one on the webstore so maybe they were sold out on the road. Mr. Ware also wanted the “Summer” design so maybe we’ll all lean heavily on Echorich, who is seeing the show in nearby Tampa in November. So I have to say that this evening had gotten off to an underwhelming start for the VIP outlay. Had I any choice in the matter, I would have been annoyed that paying 2x cover for tickets merely got me uninspiring versions of songs I’d heard earlier under better circumstances. Of course, I simply bought VIP because it was the only way to get a block of five seats as the seats were evaporating 20-40 a second as the sale opened! Since I saw two synth rigs onstage, I knew that we’d get have to get some synthesizer in the program, but it seemed like the acoustic tour had colored Simple Minds attitudes, and not for what I’d consider the better. Whenever there had been acoustic guitars in their music in the past, they’d really lost me. I was fervently hoping that this VIP soundcheck would not be representative of the main event. 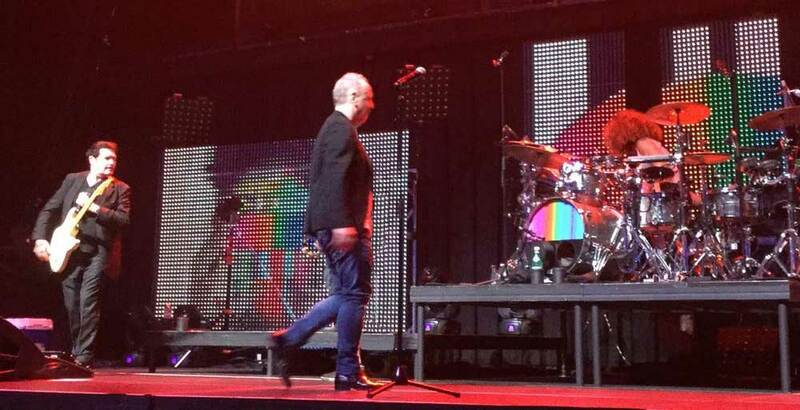 This entry was posted in Concert Review, Core Collection, Scots Rock and tagged Atlanta, Simple Minds. Bookmark the permalink. Steve – That was hands down the fastest comment ever! There were a few changes. One that I envy you for, definitely. Some of the synth-heavy, pre-“Sparkle in the Rain” tracks were revamped into more conventional guitar/bass/drum songs and lost some of their atmospherics (though “Hunter and the Hunted” and “I Travel,” and “Themes for Great Cities” were truly phenomenal!). The only cut I was really surprised that they didn’t play was “Love Song,” since it was such a big underground hit here in NYC (Danceteria) and on WLIR in the ’80s. Dave Myrvold – Check’s in the mail! I was at the Boston show last Wednesday. My view from the 4th row – FAB! I quite liked the setlist, thought the band sounded great, but was a bit disappointed by some of the arrangements. Personal highlights were I Travel, Theme For Great Cities, New Gold Dream, and The American. Our encore started with Book Of Brilliant Things rather than the Call cover (a plus in my book). Taffy – Many of my highlights mirror yours, but not exactly. More thoughts on the arrangements from me later today when I write part 2. I’m afraid Monk is correct in his pre show assessment. Not really being a fan of these sort of forced sound checks and Q+A vamping, it was a nice distraction, but not much else. Echorich – It was sort of nice being in the venue earlier without the cattle call aspect of entry.